Ava, Kai, and JoJo are playing with their toys at school, but they aren't ready to share and take turns. Can the teacher help them out? JoJo wants Ava's carrot. JoJo grabs one end of the carrot. "I see you both want that carrot. But Ava's not done yet. JoJo, here's the asparagus--let's make a stew with Ava." JoJo does not want to make stew. She still wants the carrot. "Ava, tell JoJo, 'You can have it when I'm done, '" the teacher says. 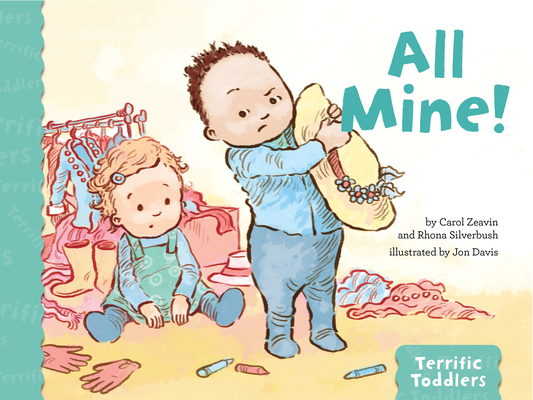 Ava says, "When I done "
All Mine is about toddlers' need to feel ownership, so they can better navigate this tricky time in their development when everything is "All Mine " Includes a Note to Parents and Caregivers written by the authors about supporting toddlers' needs for ownership. Written with simple language and reflective of children's realities, the Terrific Toddlers series is based on understanding of the developmental level of young toddlers. Titles include All Mine , Boo-Boo , and Bye-Bye . "Sharing" is simply not a concept that a young toddler can grasp...yet. It may seem counterintuitive, but in fact, encouraging full ownership, as the teacher does for JoJo in All Mine , can actually hasten the development of generosity, since allowing the toddler to fully be in this phase of development hastens her mastery of the lessons about self that it provides. It is not until at least age three--when young children are developmentally ready to want acceptance from peers and have a firm understanding of the concept of self--that they can begin to want to share. Carol Zeavin earned her BA in music from UCLA and became a successful freelance orchestral violinist and chamber musician in New York City. She earned master's degrees in education and special education from Bank Street College and worked with infants and toddlers from 1992 to 2010, both as head teacher at Rockefeller University's Child and Family Center and Barnard's Toddler Development Center, and as a special educator employed by Y.A.I. and Theracare. She continues to perform classical music in NYC and teaches violin and piano to kids and grownups of all ages and abilities. Rhona Silverbush, co-author of the Terrific Toddlers series, studied psychology and theater at Brandeis University and holds a juris doctor from Boston College Law School. Rhona is the co-author of Speak the Speech! Shakespeare's Monologues Illuminated (Faber and Faber, 2002) and has taught theater to all age groups from tots to adults. She has taught at Columbia University Teachers College and is also a freelance writer and editor and a consultant for families of children and teens with learning differences and special needs. Visit her at www.rhonasilverbush.com Jon Davis is an award-winning illustrator who has illustrated more than 70 books, including the Terrific Toddlers Series for Magination Press. He works digitally, in Photoshop with a tablet and pen and based in the Lake District, England. Visit him at www.jonsmind.com and follow him on Twitter: @JonDavisIllust.